Fans of ‘70s glam can raise their lipstick in toast as the mighty Sweet have finally become the subject of one of these cool retrospectives where they gather the motherload of clips onto one massive DVD extravaganza. 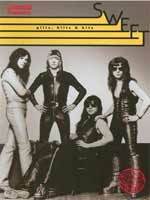 Glitz, Blitz & Hitz collects all of Sweet's bubblegum and glam-rock hits from their early days ("Ballroom Blitz," "Wig Wam Bam," "Blockbuster!") as well as rare performances of some of their heavier rock tracks from the later era (“Action,’ “Fox on the Run”). The format is a behind-the-music style documentary, complete with interviews with leaders Brian Connolly and Andy Scott, writer/producer/manager Nicky Chinn, and producer/manager Phil Wainman. Plus, there’s tons of cool bonus material from the original 16mm films that the band shot to promote their singles. My only complaint would be that you can’t really cue up the many killer live performances and video right to the beginning of the song, the chapters always start with an interview that you have to wait or fast-forward through to get to the rock. Watching the doc is great once, but after that I wanna get to the tunes. A minor grievance for an otherwise stellar DVD collection.